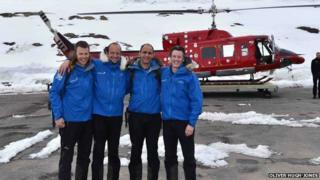 A team of four British adventurers have broken the record for the fastest crossing of Greenland. Polar explorer Tom Avery and his team, all 39, travelled 350 miles coast-to-coast in a time of nine days, 19 hours and 40 minutes - knocking more than eight days off the previous record. The journey saw them snow-kiting in temperatures of -25C on rough terrain. "We are black and blue, dehydrated, weather-beaten, frost-nipped - and it was all worth it," Mr Avery said. The previous record of 17 days, 21 hours and 30 minutes for the crossing was set by Briton Matt Spenceley and his Luxembourg team mate Patrick Peters in 2008. Mr Avery, from Cold Aston in Gloucestershire, and teammates Patrick Woodhead, George Wells and South African-born Andrew Gerber - who also hold the record for the fastest surface journey across the North Pole - had set out to complete the expedition in 12 days. But they were able to take advantage of strong tailwinds to snow-kite half the total for 17 hours straight, covering a distance of 174 miles (281km) - roughly the equivalent of London to Manchester. The team also endured a 21-hour trek on the last day of the expedition, pulling two heavy sleds of equipment each. Snow-kiting is using kite power to glide on snow or ice wearing skis or a snowboard. It was pioneered in the 1970s and 1980s in both Europe and the US on frozen lakes and large, open snowy terrains. As the sport has developed, snow kiters have been known to reach speeds of more than 60mph. They can also travel uphill. Today there are World Snow Kiting Championships, held this year in Siberia in Russia. Entrants compete for speed - known as kite cross - but also perform jumps and stunts. The Greenland expedition team used snow kiting to propel them halfway across the country in just 17 hours. Expedition leader Tom Avery said: "The conditions were right, but it's tough going on hard ground - our sleds and our knees took a real pounding." "We set an ambitious target, but never in our wild dreams thought we'd do it that fast," Mr Avery said. "We are delighted but we are shattered and exhausted more than we have ever been in our lives." The east to west crossing of what is the world's largest island was also made famous by Norwegian explorer Fridtjof Nansen whose expedition in 1888 sparked the heroic age of polar exploration but took 49 days to complete. Speaking from Greenland, Mr Avery said he and his long-time friends had barely slept in order to set the new record, and a couple of the team suffered frost damage to their feet. "One of the biggest risks we faced were rock crevasses. There were a few incidents where the ground gave way and a leg went through. "Also polar bears - we took a rifle with us, but we never saw a bear. "But the hardest bit was lack of sleep." Between them, the men had left 12 children at home to go on their record-breaking adventure. Mr Avery, Mr Woodhead of Kensington, London, Mr Wells of Bury St Edmunds and Edinburgh-based Mr Gerber are planning a celebration get-together with all their families who had backed them. But Mr Avery predicted that "it probably would not be long" before he and his team are planning the next challenge.